Ebbey's Blog Daily Life from Ebbey's Perspective. Internet Movie Database Listing (IMDB.com) Only Ebbey listed. Post your favorite Ridgeback & Ebbey LookAlike photos. 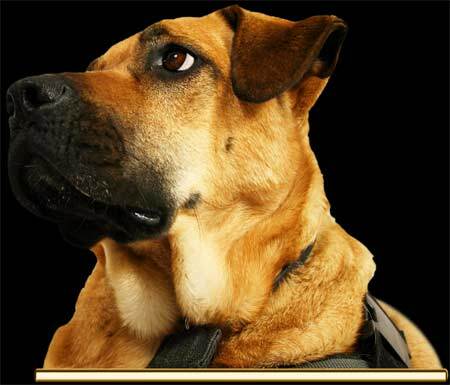 Ebbey portrays a Wilderness Search Dog Website of fictional search dog team with many photos and accurate information about search dogs. Costars in the Film 'Search Dog's Raven' portrays a wilderness search dog, Eerie Story of a Wilderness Search Dog Team, new action thriller, Ebbey key to film's unique twist, based on the real life adventures of a young woman and her wilderness search dog. Rags to Riches Story Found starving in a garbage dump, clever mongrel, wreaks havoc, naughty personality perfect for acting, adopted as an adult, rescued from an Aboriginal Reservation landfill, feral dogs shot, undernourished, various states of starvation, great sniffer, likely dumped, turbulent life, adopted by Director Allex Michael, bad nightmares, numerous scars. Ebbey's Behavioral Problems stubborn, Rhodesian Ridgebacks not for first time dog owners, few ridgebacks in films, very strong and focussed, behavioral baggage, kennel phobia, escape artist, hyperactive, opening fridge, stealing food, digging indoors, destroying yard, jumping fences, ultrahigh prey drive, getting lost. Ebbey's Behavior and Mysterious Symptoms difficult, eye discharge, vomited frequently, wax in her ears, scratching and chewing herself, depressed immune system, wouldn't sleep. Allergies Worsen Behavioral Problems Allergic owner discovers allergies in dog, self mutilation, increased behavioral problems, ear cleaning, itchy skin, homemade elimination diet, lingering effects from starvation, vomiting bile. Filming Ebbey Works inexperienced actors and untrained canine increase film costs, natural tracking dog, working tired Ebbey out, breaking itch and chew cycle, naughty behavior continued, tries to eat any object, garbage surfer, digger, drags owner, talks back, growls. Ebbey as an Actor zealous sniffer, good on camera, new film Search Dog's Raven, portrays an older canine, does no tricks, exploiting natural behaviors, naughty streak, scent hound, like filming reality television, planned reaction shots, short attention span, pivotal character, Search Dog's Raven. Rhodesian Ridgeback Traits biting power, sharp front teeth, protective, bravery, hates coyotes, scars, Search Dog's Raven DVD. Ebbey Trivia with Photos Fans all over the world, Tangle Puppy, Naughty Habits, Patience Training, Faithful Companion, Sniffer Dog Spoiling Ebbey, Affectionate Displays, Prey Drive, Lots of Attention and Exercise, Mirror Recognition Test, Strong instincts, Nibbles, Older Canine Roommate, Always Supervised, Mind Photos Leash Trained Sort of, Gator Mouth Pit Bull, Pit Bull Biting Power Controversy, Extremely Athletic, Children's Shows, TV Watching Dog, Nuzzler and Burrowing, Velvet Ears, Shortcut to Praise, Brush Time, Ebbey's First Toy, Toy Destruction, Trying to be Good, Find the Car, Power Digger, Naughty Puppy, Garbage Dump Cat, Kitty Empathy, Where is My Camera Crew, Ebbey's First Porcupine Encounter, Whine Screaming for Hares, Raven Envy, Naughty Ravens, Raven Encounter, Mouse Encounter, Ebbey Name Origins. Ridgeback nail cutting. Ebbey Photos About Adopting a Stray Dog Please Adopt a Stray, Car Ride Dumping, Angry Attention, Nightmares, Food Stealing and Starvation, Living in a Wild Dog Pack, Canine Forgiveness, Enthusiastic Feeding, Scavenging and Meals, Out of Control, Wary of Indoor Floors, Stressful Adjustment, Indoor Surprises, Dumped at Doggie Daycare, Car Ride Fear, Long Thankless Adjustment, Eye Fetish, Containment Phobia. Anxious Wait, Growth Spurt and Starvation, Exploiting Every Opportunity, Stress or Uncertainty, Discipline Issues, Discarded Dog, Target Practice. Water Phobias, Snow Eater, Always Alert, Feather Pillow Annihilated, Ridgeback Fur, Destructive Tendencies and Toys, Adopting a Stray, Adopting Strays More Difficult.